City carpfisher. There will be 5 different venues for this years championship. 1. The draw will be EXACTLY 1 hour before the start of fishing. 2. Pegs/flags shall be 10-20 yards apart and must be staked out by club official(s) and numbered PRIOR TO DRAWING PEGS. 3. Anglers may go to their pegs after the draw is completed. 4. During the preparation period, competitors may set-up their gear, test their rigs, and plumb depth. NO FEEDING IS ALLOWED DURING THIS TIME! No bait on hooks during this process. 5. Ground bait/chum may be thrown-in by hand, by catapult, throwing sticks, spods and bait droppers. 6. Anglers must be positioned NOT farther than 3 feet to either side of their peg/flag. An angler may fish up to HALF THE DISTANCE TO THE NEXT PEG on either side. THIS ALSO GOES TO THE ANGLER WITH AN END PEG! If pegs are 20 yards apart, you may only fish 10 yards to either side of your flag/peg. NO 50 yard casts to the side if your of an end peg. 7. Wading is not permitted. You may go in after something that has fallen into the water, but NO fishing from the water. 8. Anglers will be restricted to 2 poles, 2 lines, 2 hooks at a time. An angler may have as many spares set-up ready at any time, but may only use 2 at a time. 9. Ledger, feeder, hair-rigging, and float fishing are allowed. 10. NO artificial lures,jigs, may be used. 11. An angler MUST STRIKE, PLAY the fish UNASSISTED. No help from other anglers or guests or interested spectators. A fish may be played into the next peg area but only for the shortest amount of time as possible. NO walking over to where the fish is. It must be played and landed from your peg/flag. Netting the fish may be done by anyone. 12. Anglers under the age of 13 are allowed to fish but MUST be accompanied by supervising adult. The supervising adult is allowed to assist the minor angler. 13. Competitors MUST STOP FISHING when the horn sounds to end the match. All lines are to be removed in a timely manner. 14. We will use the weigh as their caught format. There will a board with the current standings of fish caught. THE WATER WHEN TIMES-UP, THE FISH WILL NOT COUNT! 16. Weigh-in must be conducted by an official and verified by both the official and the angler whose catch is being weighed. 17. In case of any violation of the above rules, where a complaint has been launched, the decision of the official(s) will be final. 18. 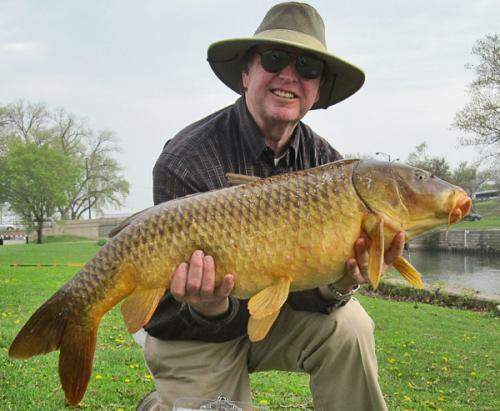 Angler's shall conduct themselves in a manner not prejudicial to the sport of carp fishing. Any questions to this rule will be decided by the local law enforcement officer. MIND YOUR MANNERS!!!!!!! June 11 and 12 Jackson Park Harbor(outer)6400 S. Coast Guard Dr. I'll do my best to answer all. GOOD LUCK AND GOOD CARPIN' !!!!!!!!!! Hello fellow carpers, Tracy here. We're almost there. I've been out of work for 2 months because of a wrist injury that required surgery. I'm at about 80% and getting ready to go back to work and take on the new carp season. The trophy company in England that supplied our awards stopped making them. The replacements are smaller and, excuse me, look kinda crappy. So I had to come up with a new trophy. I've been debating doing this for a couple years and even took an unofficial poll amongst the members and was 50/50. Well here it is. I should have word from sponsors shortly and will let you know as soon as I do. I'm making a couple of changes to the league to hopefully make it alittle more interesting. This year the "BIG FISH" cannot be included in your "BIG 5" entry. If the "BIG FISH" gets knock off the top, it can then be added to your 5 total. You can still win both prizes but you'll need 6 fish not 5. The other change is entry fee, it will be $20 for the weekend or $100 for the year. Based on 20 carpers and 100% pay-out: 1st place-$1000 2nd place-$500 3rd place-$200 BIG 5-$150 BIG FISH-$150. Also we are fishing 2 completely new venues to the league and ALL venues have BIG fish possibilties. Lastly if you can let me know whose coming so I can plan and make enough space. Thanks guys, let me know what you think and we'll go from there. later P.S. Thanks to 2009 league champion and current CAG secretary Dan Remir for modeling the new league championship prize. I'm in too. See you soon. Yeah lockport has always been like that. The CARP ANGLERS are the only ones that kept it clean. big fish pay by the day? Yes theres a seperate big fish pot and total weight for both saturday and sunday. Big fish is 5.00 and total weight is $10.00. So $15.00 per day for both pots and $20.00 for the league fees lets you play all weekend. You can park on the west side of the zoo along Stockton Drive for free and just take a short walk to the venue. You can also drop your stuff off at the venue, as long as you exit the lot within 30 minutes. More than likely, there will be participants already there to watch your gear while you park. The sessions start early enough to give you a good chance of finding a decent free parking place. A nice feature of the league is that you have choices. You money guys can get in daily total weight and big fish pots and spend the $50 per weekend, but you can also get in the league all weekend for $20. That's $1.25 an hour, boys--not a bad rate for some nice conversation, good camaraderie, and a chance at some big fish. That's almost as good as those Wisconsin venues, and you don't have to travel as far and guzzle gas. Fish on! Huge! ...I have to admit, that Windy City Champion jacket looks good on me... game on! Interests:Psychology, research, cycling, and occasionally poking my head out my office. I will be there. And as the new king of blanking I will be the only easy money there. You took a big victory there two years ago, Rob. The crown, err...vest, fits all! Hello guys, Tracy here. Sorry about not not posting sooner. Went back to work last wednesday and have been working 10 hr. shifts. So needless to say, I've been pretty wiped out. This weather has been a pain in the Tried to fish the canal saturday morning early. Ed and Jesus were there attempting to fish. This is for the non-Chicagoans, Saturday started cloudy, rainy, and windy. I mean WINDY!!! The day started at 42 degrees and water temp was 50 degrees. Wind was off the lake at 15/20mph with gusts to 40+. The rods wouldn't stay in the pods. Finally gave up and went to see how the Indiana league was doing as they had a stop just across the border on Wolf Lake. Wasn't any nicer there and more rainy than the city. The rain continued through 8pm sunday. Was out at multiple venues sunday and still couldn't get out of the wind(stronger than saturday). The weather reports are for 80 degrees saturday and chance of rain(no wind-yea). Sunday warmer and less chance for rain. The upside is the rain we will get over the next couple days will be with a southern wind and the rain will be warm. Water temp should get to the low 60's by weekend. Almost perfect. I'm hopeful that will be the signal for the fish to come in this weekend. As some of you know, the females that have been caught(be nice you naughty minded reader ) have bellies that are at least 2 weeks away from being ripe. So they'll swell alittle in the mean time. Not exactly sure how many we will have this year but it will be interesting non the less. Nice to see you on the site Rob. Seems to me you were the one with the target on your back for 99% of the season a couple years ago. It still amazes me that some caught you with only 2 hrs. left in the season. Sorry didn't mean to rip that wound open. Will see you guys bright and early saturday morning and LET THE GAMES BEGIN!!!!!! I'm looking forward to this weekend, I will be there both days. It should be fun no matter how many fish are caught and regardless of weather conditions. By the way, sunny, 75 degrees and light winds doesn't mean lots of fish so hopefully the weather doesnt keep anglers home You just never know when they will be hungry or not. The only weather that will keep me from fishing is lots of cloud to ground lighting. I couldn't agree more. I am also really looking forward to a couple of days at the canal rain or shine, seeing everyone and hopefully catching a few. Tracy - To assure accuracy, I figured I'd just stay a little later each Sunday and copy the weekend's results while you are taking down signs. That way, I can get things posted by sometime Monday, and people know where they stand almost immediately. This will also serve as a checks and balances tool as you can compare the original figures against the website. Don't fish out the venue on Friday. A few of us would like to catch a fish or two on the weekend. 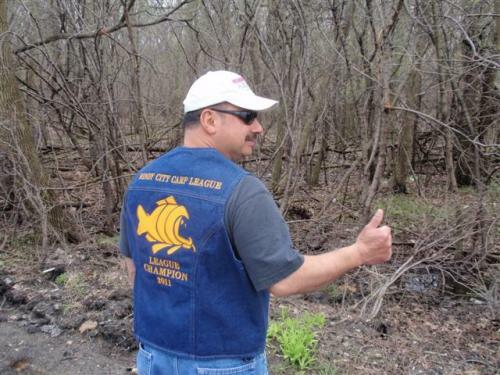 Click here for Windy City Carp League 2011 website. 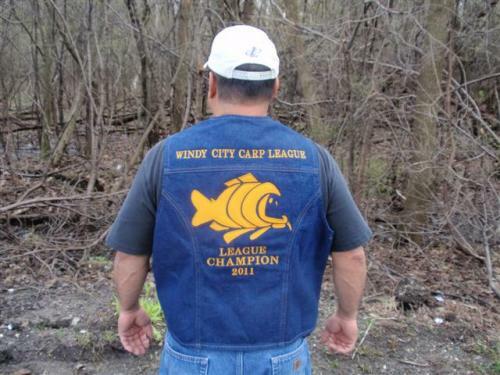 By the way, just because your picture may not currently be on the WCCL website, that doesn't mean that you can't participate in the Windy City Carp League. We can always add to the tables and photos and lists of participants. We are just a day away from the first session at the Lincoln Park Rowing Lagoon. We are also nearing the time when the big Lake Michigan females enter the lagoon to begin the spawning ritual. I'm not saying that you won't do well in the league if you miss the May 21 and/or 22 sessions, and the remaining venues all have potential for big fish; but it might be tough to make a comeback if those fishing the first weekend record 50-75 pounds or heavier for their big three. It's kind of like the White Sox realizing that they better start winning after wasting the first quarter of the season. It's do-able, but difficult. Click here for WCCL 2011 website!